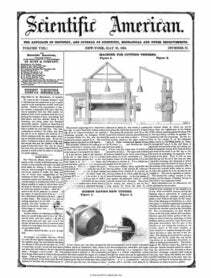 J. S. Underhill, of the city of New York, has taken measures to secure a patent for an improvement in boilers for steam engines. The object of this invention is for the purpose of obtaining a more complete heating surface by a geculiar arrangement of tubes and water "paces,*nd also for the purpose of providing amps whereby the soot and ashes may be removed with more facility and ease than ha* heretofore been done. Mr. U. places a porthB of the tubes vertically and others laterally within the boilers—his boilers having vertieaiJRdes and ends with an arched top, and is really a good arrangement. There seems to be little room left for improvement in steam boilers, no one, however, can tell what may yet be done,—an age of improvement this, certainly.